LEROY NY SCHOOL DEMONS: Tourette’s Like Syndrome affects 12 school girls. Is the Tourette’s Like Syndrome cluster of 12 girl students at Leroy Jr. Sr. High School in Leroy, New York, Mass Hysteria, also known as Conversion Disorder which, if it occurs in a large group, is labeled Mass Psychogenic Illness? 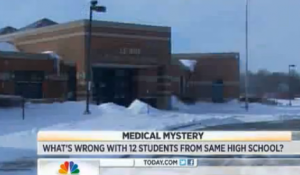 CBS) Why did 12 teens from the same town in upstate N.Y. all begin to experience odd symptoms at once? Doctors say it’s an outbreak of mass hysteria. A day after the girls’ interview, Dr. Laszlo Mechtler, a neurologist at the DENT Neurologic Institute in Amherst, N.Y. who has treated several of the girls, decided to come forward to offer an explanation to quell the curious masses. Mechtler’s diagnosis? The girls may have a conversion disorder – also known as mass hysteria. Conversion disorder is a condition in which a person can experience blindness, paralysis, or other neurologic symptoms that can’t be explained by another disease. The disorder often occurs because of a “psychological conflict.” According to the National Institutes of Health, symptoms of a conversion disorder are thought to resolve a conflict a person feels inside. For example, a woman who believes it’s not acceptable to have angry feelings may experience numbness when they get really mad. Mechtler told USA Today that when a conversion disorder occurs in a large group, its known as a “mass psychogenic illness,” because it affects groups of people in the same environment, such as in a classroom or office. That means watching the girls on television won’t cause others to experience similar symptoms, he said. Video of Today Show interview, an interview where the parents of two of the girls claimed authorities “lied” about having a diagnosis and have failed to show any documentation backing up claims the strange, bizarre disorder doesn’t stem from an environmental cause. The video reveals just how debilitating the disorder is for one student, a disorder which a diagnosis of mass hysteria doesn’t seem to fit. Sorry the Wayback Machine does not have this video archived. The above quote from our original January 12, 2012, post Demon Infestation at New York School District? 12 Students With Tourette’s-Like Symptoms. The diagnosis: Mass Hysteria, Conversion Disorder, and Mass Psychogenic Illness. We asked, how long do cases of Mass Hysteria last? From the Top Ten Bizarre Cases of Mass Hysteria, the ‘Tanganyika laughter epidemic’ which allegedly lasted ’6-18 months’ in 1962. Other symptoms: “Fainting, pain, respiratory problems, rashes, and attacks of crying”. The 1994 “Toxic Lady” Case in Riverside, California: Hospital workers who treated “Toxic Lady” Gloria Ramirez fell ill and fainted, from the “smell of death”, the official ruling of the Coroner’s Office. A more thorough investigation revealed Ramirez, suffering from advanced cancer of the cervix, may have dosed herself with a home concoction of DMSO. The Livermore scientists hatched the following hypothesis: (1) Ramirez doses herself with DMSO. Due to urinary blockage, the stuff builds up in her bloodstream. (2) Oxygen administered by the paramedics converts the DMSO in her blood to a high concentration of DMSO2. (3) When the DMSO2-laden blood is drawn out in the syringe and cools to room temperature, crystals form (this was confirmed by experiment). (4) DMSO2 is converted to DMSO4 by some unknown mechanism (the defibrillation shock?) and clobbers the medical staff. (5) The volatile DMSO4 evaporates without a trace. The 1915 Dancing Plague in Strasbourg, France, where people danced for months, night and day, some dying from heart attack, exhaustion, or stroke. What these events do explain, just how rare ‘Mass Hysteria’ events occur. Events which were explained as ‘Mass Hysteria’. [Found archived here: https://web.archive.org/web/20120122024200/http://deathby1000papercuts.com/2012/01/tourettes-like-syndrome-cluster-in-new-york-school-mass-psychogenic-illness with the original comments to the article. Letter to Jerome Grasser, NY Legislative Associate: 12 Leroy girls affected by tics and tourettes-like symptoms! Erin Brockovich Team to Test Ground Samples at Leroy High School Ground…BUT Will They Dismiss Poison in the Vaccines? Is Social Media Spreading Twitching Hysteria?